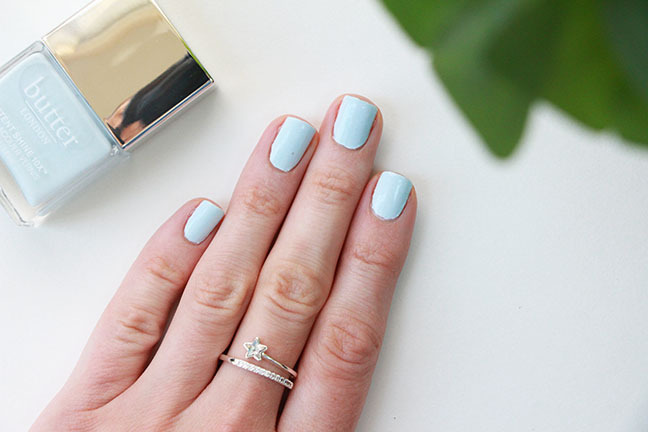 The shade “Candy Floss” is a pale, white-based baby blue. I really love the shade and it’s surprisingly opaque for such a shade. These photos show 3 coats, but my first coat was applied pretty sloppily which made it a bit streaky on some nails. Had I been more careful, I think this would cover in two coats without trouble. It has great pigmentation and is probably one of the best pale blue formulas I’ve tried thus far. It was easy to apply, but I was rushing hence the messy first coat. There is a noticeable air bubble on my ring finger, but I’ve come to the conclusion that these bubbles are more likely due to either the base or top coat, not the polish itself. I really like the brush on these polishes too! It’s quite reminiscent of the Nails Inc. brushes. They are pretty flat with a medium width and slightly rounded tip. It makes it quite easy to apply to the nail. And this formula was pretty much the perfect consistency in that it’s not too thin that it runs and pools or overly thick so that it doesn’t spread out on the nail easily. Absolutely love this formula and the packaging is superb! 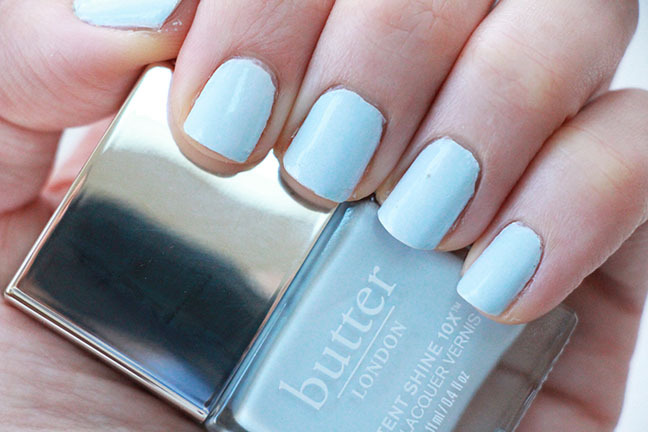 For me, both the formula and the shade of Butter London’s “Candy Floss” are absolute winners! Highly recommend the Patent Shine 10x Nail Lacquers!